I took these photos of Lucky & Phoebe last week as the hot days roll on. We were lucky to have an afternoon of storms last Thursday that resulted in 20mm of lovely rain. A real boost to the garden & my water tanks. However, the hot weather has returned. More storms are predicted for this week but no real cool change yet. 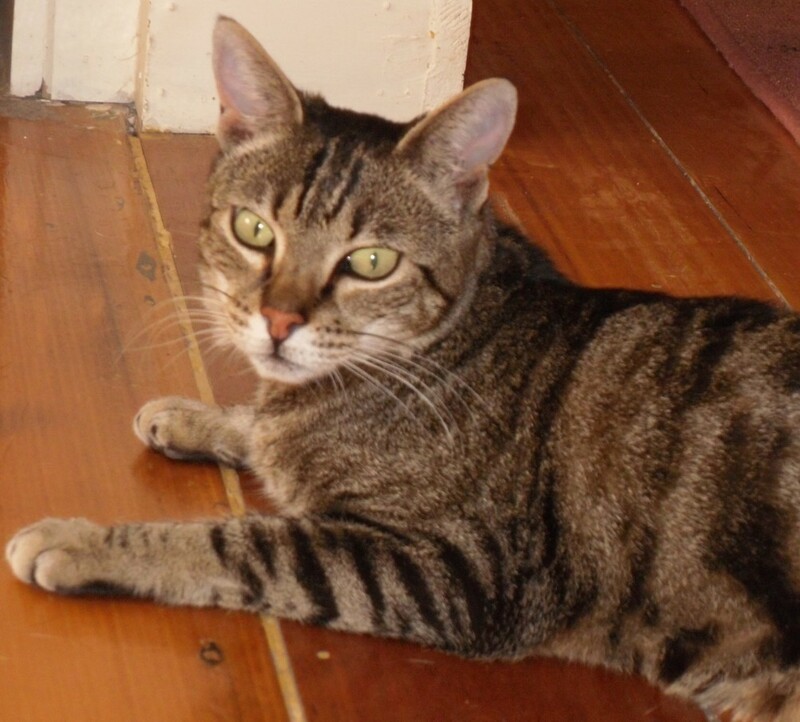 But, when it's hot & I'm at home & the air conditioner's on, the only place to be is flaked out on the floorboards in the kitchen. And, when I'm outside in the very early morning, tidying up the garden & trying to think of more zucchini & tomato recipes for all my lovely homegrown vegies, Phoebe has another favourite spot. I wish my trees weren't dropping their leaves already, but they are. 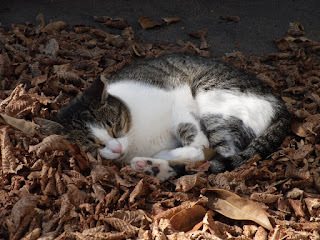 Phoebe thinks the leaves have dropped just to provide her with a comfy bed & who am I to disagree? As summer shows no sign of moving on, I've chosen a poem about summer this week. 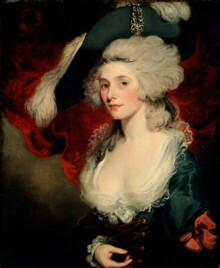 Mary Robinson was an actress, famous for being the mistress of the Prince of Wales, later George IV. She was also known as Perdita, the role she was playing when she caught the Prince's eye. Like Jane Austen, I dislike the Prince & think he was self-indulgent, spoilt & treated women very badly. There have been at least two biographies of Mary that I'm aware of & she seems to have had a short, sad life. However, I wasn't aware that she was a poet until I came across A London Summer Morning in my anthology of Romantic poetry. It's a lively portrait of late 18th century London. Housemaids beginning their work, chimney boys, knife-grinders, shopkeepers getting ready to start the day's trade & the lamp lighter ending his work until the night. Two of the Lucy poems today. Partly because I think they're lovely but also because I was rereading Barbara Pym's A Glass of Blessings last week & Wilmet quotes the last lines of the second poem & reminded me of them. I'll give them the numbers they have in my anthology but I've seen them numbered differently elsewhere. I'm taking a little break from blogging for a week or two. Summer has been going on quite long enough for me but somehow it doesn't look like ending any time soon. Summer in Melbourne usually means three hot days & a cool change. So far, we've had a week of temperatures over 30C & there's almost another week to come. So I'm feeling a bit wrung out. I'm doing lots of rereading - A Glass of Blessings by Barbara Pym, Daughter of Time by Josephine Tey, dipping into Kathleen Jamie's Sightlines & reading some of the piles of magazines & journals tottering on the coffee table. I've been listening to Jeeves & the Feudal Spirit by P G Wodehouse read by the inimitable Jonathan Cecil on the way to work which has made me laugh every morning & I've also discovered the delights of history documentaries on Youtube so I've been In Search of the Dark Ages with Michael Wood & having a wonderful time. 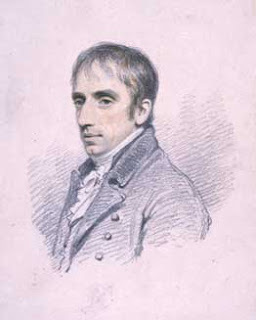 I'll still pop in with some Sunday Poetry, Wordsworth this week. And I'll leave you with some links & some bookish news. The Virago reprints of Rumer Godden's novels are here. I preordered these three last year & they arrived this week. I love stories about nuns & In This House of Brede is one of my favourites. I've seen the movie of Black Narcissus but never read the book & I have a copy of A Fugue in Time that I picked up from a secondhand bookshop. I believe China Court is a sequel or reimagining of the earlier book. Leave & Pages has reviewed A Fugue in Time here. 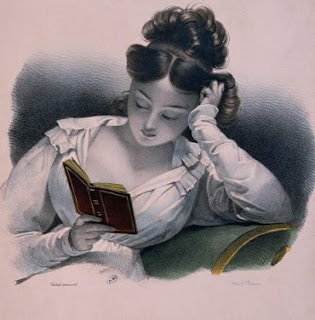 For all the Ricardians & Janeites out there, here's a lovely blog post about the connections between Richard III & Jane Austen. I knew that Jane was a Yorkist but I'd never really considered before her dislike of the name Richard. Greyladies are publishing a couple of very tempting books this month. 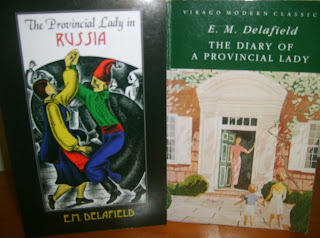 Reading about the Gladys Mitchell book, On Your Marks, about a young PE teacher reminded me of Josephine Tey's Miss Pym Disposes & this recent review has inspired me to reread it. 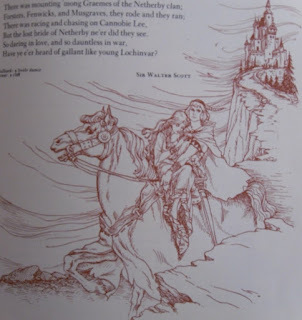 The other new book from Greyladies is Return to the West by Mabel Esther Allan & has a Scottish setting so I have to have that too. I'm calling them belated birthday presents to myself as I've been on the book buying wagon since Christmas. See you after the cool change! One of the advantages of this newer anthology of Romantic poetry is the number of women poets included. 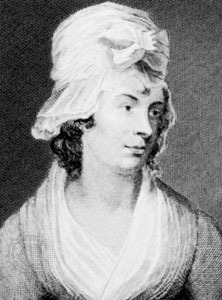 I knew of Charlotte Smith (picture from here) as a novelist but didn't realise that she was also a poet. This poem, To the South Downs, is from her Elegiac Sonnets, published in 1794. I don't think any of her novels are in print today, except in expensive POD editions. Pandora reprinted The Old Manor House in their wonderful Mothers of the Novel series back in the 1980s but it's long out of print. She was said to have been an influence on the Gothic novels of Ann Radcliffe. 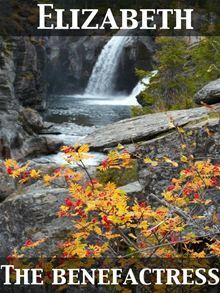 This is a lovely though melancholy poem with that love of Nature that inspired many of the most famous Romantic poets. There's no oblivion--but in death alone! One of my resolutions this year was to get back to reading some of the authors whose books I've been collecting but not reading. I've read several books by Elizabeth von Arnim but that was some years ago & I have some Virago editions on the tbr shelves. Of course, when the mood struck, I wanted to read one of her books that I didn't own so I bought a Kindle collection of 11 of her books which seemed to be the only way I could easily get my hands on The Benefactress. It was the reviews by Leaves & Pages & The Captive Reader that led to buying the Kindle version but it's taken me another six months & my reading resolution to get around to reading this delightful book. Anna Estcourt is unhappily living with her brother, Peter, his wife, Susie & their daughter, Letty. Peter & Anna are financially dependent on Susie & there is little sympathy between the two women. 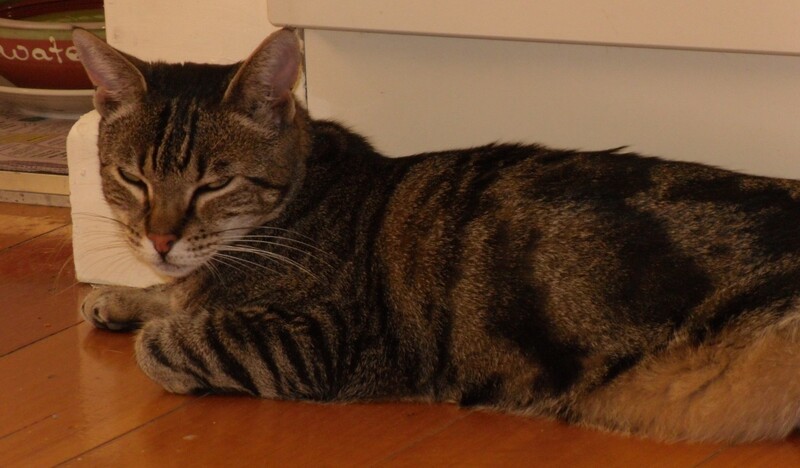 Anna is 25, attractive but totally uninterested in society & finding a husband. She's unhappy at home but not unhappy enough to throw herself into marriage for the sake of escape. When she inherits a property & some money in Germany from her Uncle Joachim, she is determined to live there & do good in the local community. She doesn't know much German but sets off accompanied by Susie, Letty & Letty's governess, Miss Leech. Anna arrives in Pomerania to find her house & servants waiting to greet her. The land agent, Dellwig, decides that he will have no trouble pursuing his own schemes with a young Englishwoman as his mistress. The servants are willing but not very intelligent & Anna's basic German is another barrier. Susie is disgusted with everything & when her maid revolts & wants to return home, she goes as well, leaving Letty & Miss Leech to chaperone Anna. The parson, Herr Manske, is kind & her neighbour, Axel von Lohm, was a friend of Uncle Joachim & feels protective towards his niece. Anna makes many mistakes in her first weeks at . She asks the parson to dinner without including Herr & Frau Dellwig. She walks around unchaperoned, although she employs an impoverished noblewoman, Princess Ludwig, as housekeeper & companion. She declines to listen to Dellwig's advice. She decides that she wants to help other women who need independence & wants to invite twelve such women to share her home. The parson is happy to help & composes a letter to put into the newspaper. However, the first three applicants are not exactly what she was expecting. Frau von Treumann & Baroness Elmreich are snobbish women who look down on the third member of their company, Fräulein Kuhräuber. All three women are ill at ease, suspicious of Anna's motives & disapproving of her manners, her clothing & everything about her. Anna's basic German leads to upsets & misunderstandings. 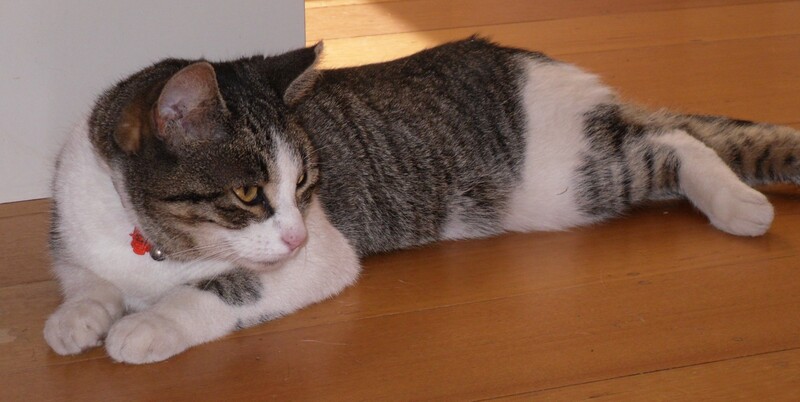 Axel von Lohm is also dubious about the antecedents of all the new inmates. There's some family scandal in the backgrounds of both Frau von Treumann & the Baroness & nothing that Anna can do can make the three women friends with herself or each other. Plans for another nine beneficiaries are quietly dropped as Anna realises just how difficult a task she has taken on. There are some very funny episodes such as Anna's niece, Letty's, interference in her aunt's love life. Her meddling leads a young curate to imagine himself in love with Anna & that she returns his feelings. Frau von Treumann has a son, Karlchen, who she decides would be a perfect husband for Anna. Her pleas to Anna to allow Karlchen to visit her lead to several meetings where Karlchen's comical attempts to impress Anna are completely ignored. Anna is more distressed when her friendship with Axel is changed by his proposal of marriage which she rejects. It takes a near-tragedy to open Anna's eyes & heart to her true feelings. I enjoyed The Benefactress very much. It's another of those beguiling books where a house is inherited & we follow the attempts to make the house a home. There isn't a lot of detail about new furnishings & landscaping gardens but Anna's efforts do improve the house & by the end of the book, she has realised that her future does indeed lie in Germany. Her dreams of being a benefactress to those less fortunate than herself may be idealistic & impractical but she's a kind-hearted young woman. She knows how miserable it is to be dependent on relatives or friends who provide the material needs of life but not the intellectual or spiritual needs. Perhaps inevitably for a book published in 1901, Anna is destined to realize that the obstacles she faces will be easier to overcome with a man by her side. 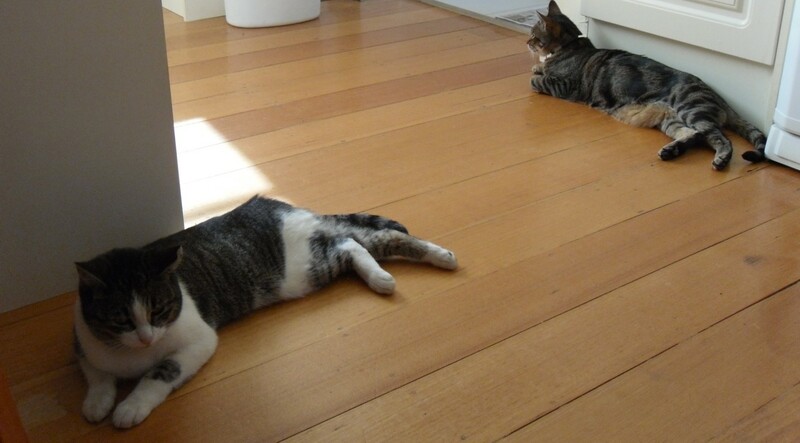 Luckily she also realises that she will be happier with Axel than she could ever be on her own. There's a copy of The Benefactress available at Anglophile Books. Well, it's official. 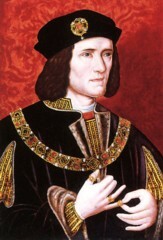 The remains found by the archeological team in a car park in Leicester are those of Richard III. The media conference held at the university of Leicester was very exciting. I was able to listen to it through the BBC Radio Leicester website. The scientific evidence was explained by the members of the archaeological & scientific team & all the evidence points to the conclusion that the remains are those of Richard III. More information can be found at the websites of the Richard III Society which is about to be updated & the University of Leicester website here. The results of the scientific testing, especially the DNA results, are fascinating & I can't wait to read more details about all this in future publications of the Richard III Society. I also hope that the documentary shown this evening in the UK, The King in the Car Park, is shown here or made available on DVD very soon so eager Ricardians can have a chance to see it all for themselves. The quote I've used for the title of this post is from a poem written by the compiler of the Clare Roll, an armorial history of the Clare family who counted Richard, Duke of York among their descendents. Richard III was this Duke of York's son & the poem lists the children of the Duke of York & his Duchess, Cecily Neville. The description of Richard, Richard liveth yet, has been interpreted as meaning that Richard was a sickly child whose survival was worthy of note. It could also just mean that Richard was alive (at the age of three or four) unlike several of his siblings who had died young. Contemporary references to Richard's appearance will be re-examined with interest in the aftermath of the scientific observations & tests conducted on the remains. These are very exciting times for anyone interested in medieval history. I've had a lovely time browsing through the first section, Romantic Hallmarks, of my anthology The New Penguin Book of Romantic Verse. 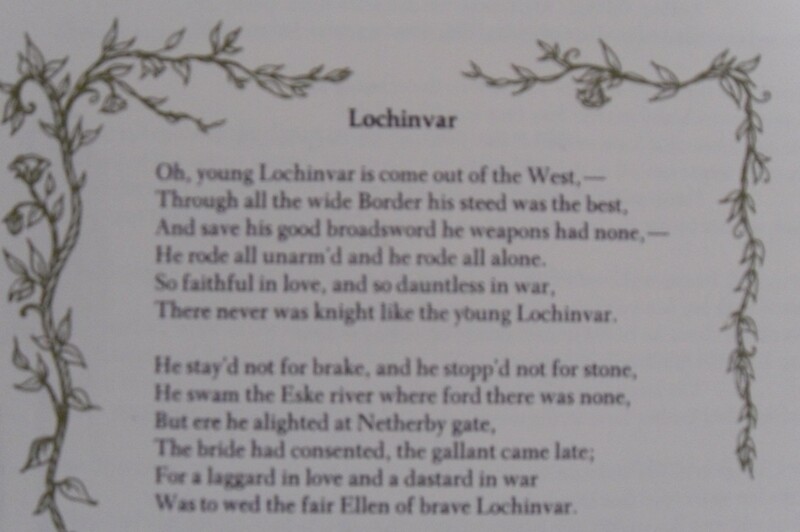 Lochinvar by Sir Walter Scott is one of my favourite poems. 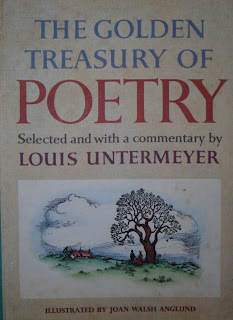 I first read it as a child in this anthology by Louis Untermeyer. This edition is dated 1968 although I was probably a little older when I really began to enjoy it. 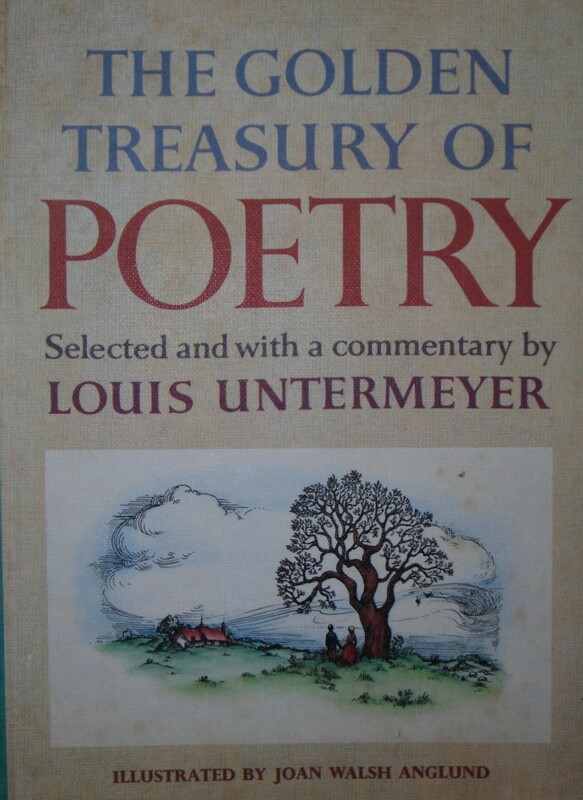 Looking through it again I was reminded how many of my favourite poems were first read in this book. 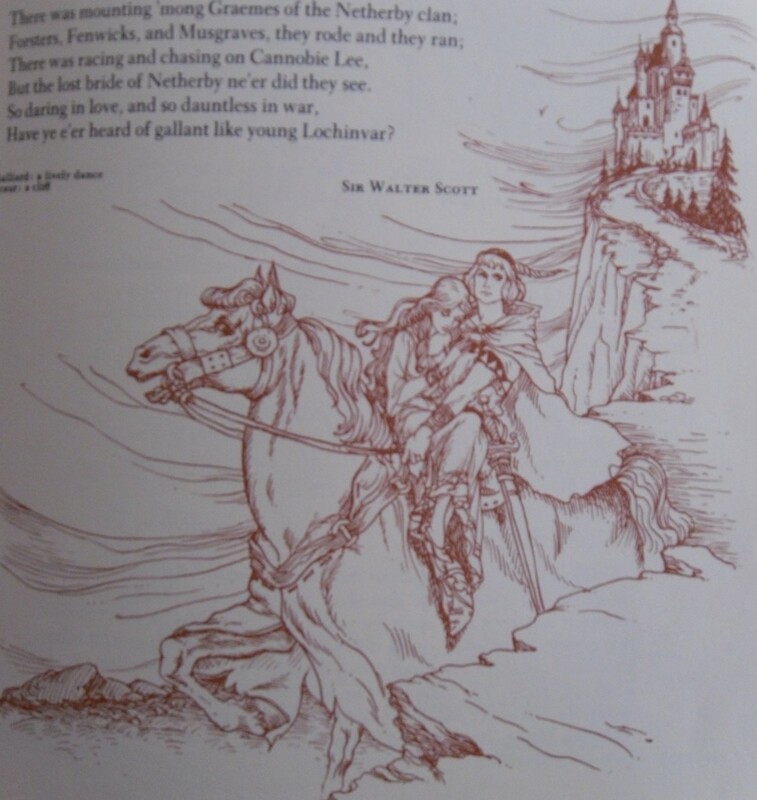 The lovely illustrations by Joan Walsh Anglund have also become part of my memory of the poems. I've also been listening to a BBC audiobook called Great Love Poems over the last week & Lochinvar was beautifully read by Bill Paterson so finding it in my anthology was obviously meant to be. 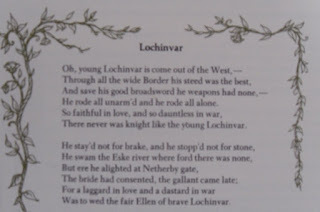 Lochinvar is part of the much longer narrative poem, Marmion. It is Marmion that St John Rivers gives to Jane Eyre on that wintry November night when he tears an absentminded scribble from the corner of one of Jane's drawings & discovers her secret.